If you are looking to become a certified stock market advisor or as a matter of fact an investment advisor or want to deal in stock market then you must acquire one or the other certifications associated with stock market and these are conducted under the aegis of National stock exchange. In pursuance of the announcement made by the Finance Minister in his Budget Speech in February 2005, Securities and Exchange Board of India (SEBI) established the National Institute of Securities Markets (NISM) in Mumbai and their main aim was to test the candidates in their financial world knowledge and impart them certificates. For investment advisors; one can go for NISM-Series-X A: Investment Adviser (Level 1) Certification Examination and NISM-Series-X B: Investment Adviser (Level 1) Certification Examination. Starters can get started with NISM Series-XII: Securities Markets Foundation Certification Examination and this examination has no negative marks whereas all other tests have negative marks. You can visit NISM website to get to know more about the courses which are approved by NSE. Various Stock Market Education Modules are available and one can choose as per their requirement. One can register for these stock market courses and pay the fees online and undertake the test in the examination centres. 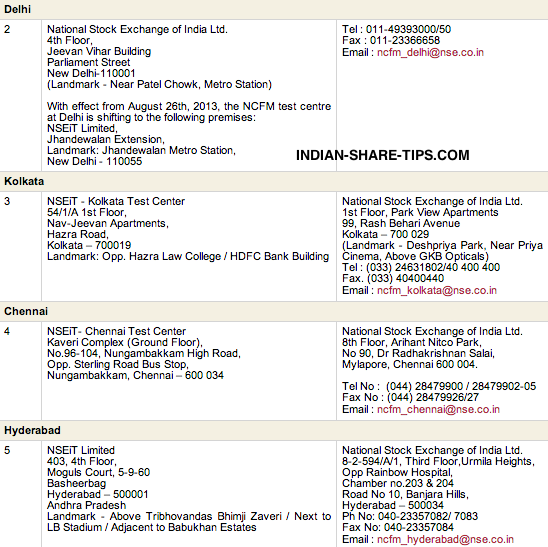 The adjacent image shows the address of the test centres where one need to take an online test. One can even take a stock market module model test here.